It recognises and celebrates organisations and individuals that deliver quality products and services to help small, medium and large businesses maximise their potential. KiwiRail, which also won the AUT International Business Export Support and Advanced Security Group Government categories, was acknowledged for its partnership with Port of Tauranga and Fonterra aimed at boosting export growth. The three-way alliance resulted in an improved supply chain, productivity, regional development, reduced CO² emissions and cost cutting. Professor Kate Kearins, Dean of AUT Faculty of Business, Economics and Law, says companies along distribution and supply chains need to join hands to solve bigger environmental issues, such as climate change. “For any systems-based problem you need collaboration across the members of the system. These issues can’t be resolved by individual organisations working in isolation,” Kearins says. Not only does KiwiRail move 18 million tonnes of freight each year – around 25% of New Zealand’s exports – its network is used for 32 million commuter journeys and it transports more than one million tourist passengers on its scenic trains and inter-island ferries. “KiwiRail is a vital part of the transport and multi-billion dollar tourism network,” says Kearins. Winner of the leadership category, Candice Kinser, has a career spanning the New Zealand technology and biotechnology sectors, ranging from advising government and working with local councils and business, through to helping school leavers and disadvantaged youth develop their career ideas and improve their career prospects. Kinser is currently director of Livestock Improvement Corporation, ERoad, Talent International, the Well Foundation and former chief executive of the New Zealand Technology Industry Association and the biotechnology research software company Biomatters. When asked how she deals with often being the only woman in the boardroom together with regularly being the only one with experience both starting up and heading businesses, she reflects on her childhood karate classes where she was the only girl in a room full of boys. Kinser says she learned in order to manage strong opposition, when an opponent throws a powerful blow, the best way to deal with it – in karate and life on a board – is neither resisting nor giving in to the power, but just going with it, maintaining sound footing and balance, and then transitioning into the next move. Kearins says the organisations that support successful businesses are the unsung heroes of New Zealand’s business community, often going unrecognised by end-consumers. “We would like to congratulate all the finalists and winners across the AUT Business School Excellence in Business Support awards. Without your innovation, enthusiasm, judgement and backing New Zealand businesses, big and small, would fail to reach their full potential,” says Kearins. 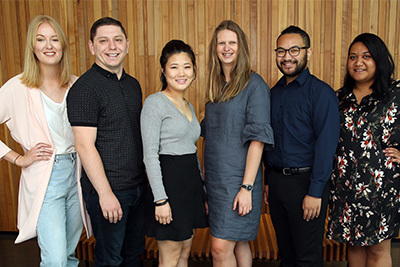 A 600-strong audience of from the New Zealand government and business sector, joined staff and academics from AUT, in honouring the AUT Business School Excellence in Business Support Award winners at a gala dinner at the Langham Hotel. Among the guest speakers were Fatumata Bah, a third-year student, studying for a conjoint Bachelor of Business in Management and Bachelor of Health Science in Psychology and Amritpal Kaur, a second-year Bachelor of Engineering in Mechatronics Engineering student, and founder and president of AUT STEM Women. 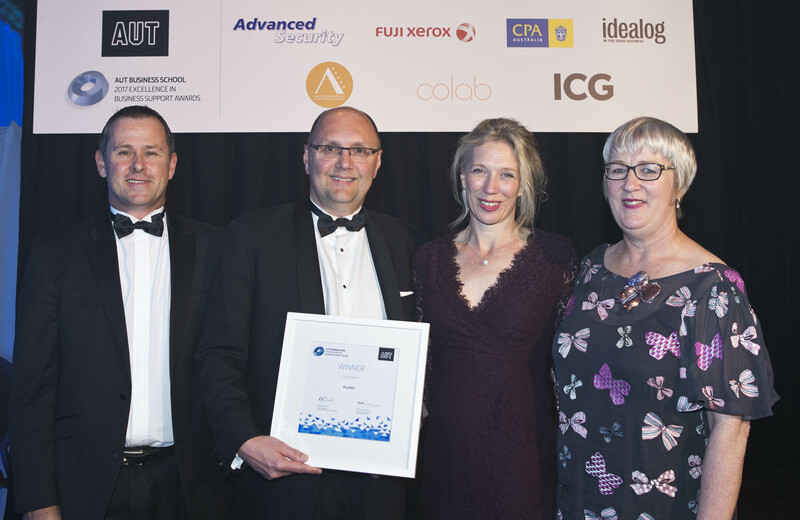 The 2017 awards were sponsored by ICG, Fuji Xerox, Idealog, CPA Australia, Colab, New Zealand Business Excellence Foundation, and Advanced Security Group.